Call of Duty: Black Ops 4 has been enjoying different degrees of success over the past six months, whether it's through sales or through reception of its battle royale mode Blackout. However, publisher Activision and the Call of Duty franchise as a whole celebrated a different sort of success last week. Activision's nonprofit charity, Call of Duty Endowment, celebrated a major milestone. After ten years of operations, CODE announced that 2018 had seen the charity take over 50,000 veterans from both the United States and United Kingdom and find them gainful employment. The numbers were crunched on the Activision website. The year 2018 alone saw 10,686 military veterans placed into well-paying jobs, with CODE taking pride in its cost-per-placement average sitting at $522, a number Activision says is almost six times as effective as efforts from the United States government. With much more left for CODE to achieve, Shacknews reached out to Call of Duty Endowment Executive Director Dan Goldenberg to learn about the charity's origins and where they go from here. Shacknews: How would you compare Call of Duty Endowment when it first started to CODE today? In what ways has it grown? Dan Goldenberg, CODE Executive Director: Fundamentally, it took us several years to develop our model that places veterans in good jobs six times more efficiently than the federal government. So, in the first 4 years we funded the placement of just over 1,000 vets; since 2013, we've placed more than 50,000. Our Seal of Distinction vetting approach, introduced in 2013 to find the highest performing non-profits, was our "hockey stick" moment. Shacknews: Can you detail CODE's process for finding jobs for veterans? Goldenberg: Our model has identified the best performing non-profits in the US and UK that place veterans into jobs -- these are the organizations that we fund (more than $36M to-date) and send veterans to. Specifically, these organizations excel at getting veterans ready to be successful in the job market and identifying employers who are a good fit -- and we ensure this approach continues to work by facilitating quarterly performance reviews of each grantee. We look at number of placements, cost per placement and, perhaps most importantly, quality of placement -- starting salary, full-time work and retention rates. Shacknews: What are some of the challenges in finding work for so many veterans? Goldenberg: Today, it's not just about finding a large number of jobs, but high quality careers. The U.S. unemployment rate masks the fact that many people are not landing jobs with enough income to meet their needs. So, it's critical that we focus on the quality of employment, ensuring that placements are a good fit for both the veteran and employer, while also providing sufficient income. Last year, the average salary of vets placed through our program was more than $58,000. Shacknews: Not every veteran comes back ready for work. Some might come back with PTSD or other mental issues. How does CODE go about helping those veterans? Do you help them find the help they need to readjust to society? Goldenberg: While the vast majority of veterans are good to go, when we encounter vets that have more fundamental needs like housing or healthcare, we follow an approach of, "refer, don’t replicate." We've had success at what we do by staying focused on our mission: employment. Our grantees have lists of leading organizations that excel in these other areas and they will try to get vets help through them. This ensures we stay focused on our mission and veteran care is in the hands of experts at every step. Shacknews: How would you describe your relationship with CODE's partners? How have those partnerships grown in the last decade? Goldenberg: We are incredibly fortunate to have found the best non-profit partners in the business. And I have to say there's no way we could have made our model work without the tremendous generosity of several corporate partners. Deloitte has performed every one of our Seal of Distinction evaluations pro bono since 2013 when we kicked off the program -- our screening model wouldn't work without them. GameStop, Sony, Microsoft, Humble Bundle and Costco have been amazingly engaged and generous partners in raising funds and awareness—they and their customers' contributions have funded the placement of tens of thousands of veterans. And, of course, the Endowment wouldn’t exist without Activision Blizzard’s support—they cover all of our overhead (so every cent we raise goes to veteran employment), donate generously to our grant fund, and provide scores of amazing employees from every function that make the Endowment go! Shacknews: What can CODE improve on to ensure that it meets its mission of helping 100,000 veterans by 2024? Goldenberg: Improving awareness that success in this work—both for veterans and their employers—is about high fit, high quality employment. Also, every $522 we raised in 2018 placed a veteran into a job, so we're always trying increase the number of veterans we help, and will keep focused on finding new ways to engage the community and partners in support of these efforts. Those looking to help Call of Duty Endowment reach its goal of getting 100,000 veterans back to work by 2024 can donate directly through the CODE website. 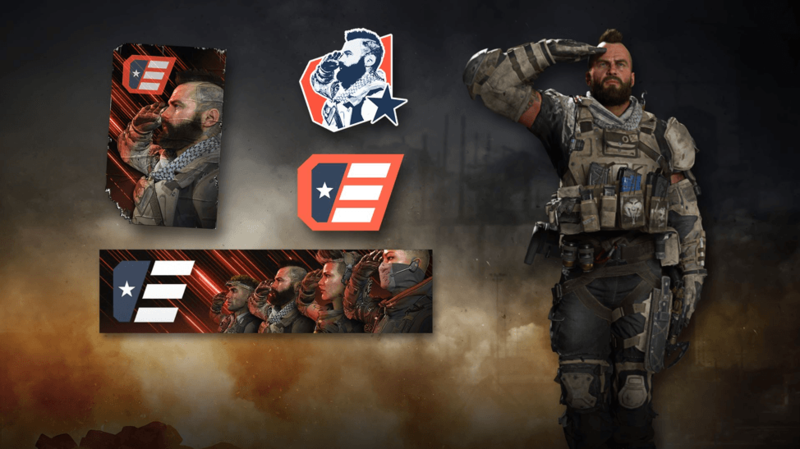 Those looking to contribute in a different way can also pick up the Call of Duty: Black Ops 4 Call of Duty Endowment Salute Pack (pictured above), with 100 percent of those proceeds going directly to Call of Duty Endowment.